Life in the village is delightfully simple. The church bells keep time each hour in a place where time seems to have stopped. In terms of modern conveniences these are also pleasantly few. Gračišće boasts an automatic teller machine, a small grocery store, a tavern, and a post office. There even used to be a café/bar here which has been closed for some time but there’s talk of it re-opening in the spring. The village also has five churches remaining of its original seven, which could be the topic of a future blog post, but today I’d like to write about the lovely little post office. Gračišće’s post office is the smallest post office I’ve ever seen. It is also the most rustic. Located just inside the village’s main arched gateway, it occupies a small stone house with traditional wooden shutters. An old water fountain stands in front and is a relic of another time – this is probably where people came to fill their buckets with water and maybe catch up on news. A few flowerpots decorate the three steps leading to the entrance. The post office is open for two hours a day, Monday to Friday. It used to open from 7am to 9am, which suited my father just fine because he liked to go buy his newspapers there first thing in the morning. (By the way, if you think 7am is early, this is the usual time offices start work in Istria! – more on working hours is planned for another future post.) Recently the opening hours changed and the post office now only opens its doors at 10:30am before closing at 12:30pm. These revised opening times have caused a minor disruption to my father’s daily schedule, and as a result he makes the 8-kilometre drive every day to Pazin to get his newspapers. “Why don’t you just wait until 10:30?” I asked him. “Because by then it’s old news,” was his reply. Why is the post office open only two hours a day? Because the same post office lady who works at the counter also delivers the mail. 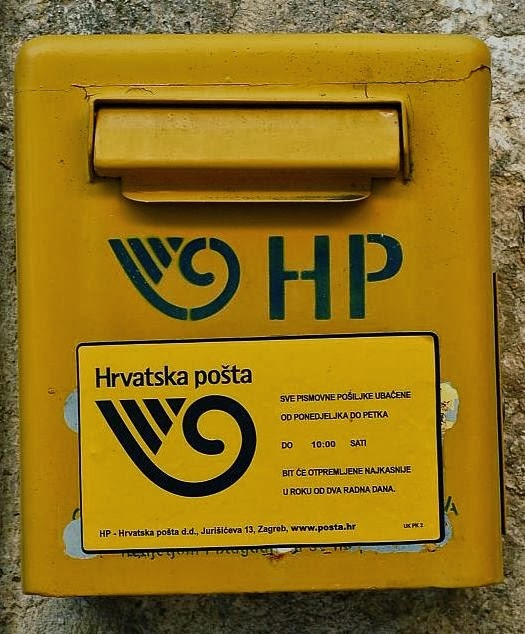 So when she’s not selling stamps or newspapers, she’s driving around Gračišće municipality delivering letters and packages. The post office lady got to know me pretty quickly because whatever I can’t find locally, I order on-line. So a bunch of packages arrived for me in quick succession (mostly books but also a cat radiator bed for the South Indian cat). She even called me once to let me know a big package had arrived for me. It took me about 30 seconds to walk over to the post office. There were no lines to wait in. Actually there was no one there apart from the post office lady who handed over my package. Then another 30 seconds to walk home. As delightfully simple as that. a cat radiator bed? ..... what is that!! ?? The cat bed attaches itself to a radiator so that kitty can keep snug and warm. Our South Indian cat has never experienced cold weather before - and at the slightest chill she goes under the covers - hence the cat radiator bed! Yes office hours here are very odd - and have you noticed that from one day to the next they change? I am so jealous! 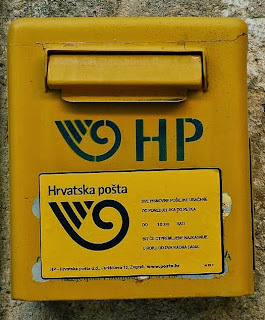 There is always a huge line at my Croatian Posta - although the good thing is my online orders get delivered to my door. I wonder why she does not deliver them to you? Sounds like you have better service SJ! You're right Kiran, every place has it's own 'rhythm of life'! Seems idyllic.Wonder what happens if the post office lady wants to take off .